Back zip with hook-and-eye closure, V-neck, inner snap-button, Long sleeves with ruffle flounce cuffs, Seamed waist, Side seam pockets, Full length with 3″ heels on, Lined in polyester moss crepe, Polyester, woven georgette, digital print, sheer, no stretch, lightweight, Machine wash cold, Model is wearing our size M/8, cut for her height of 5’9″. Made-to-order, available in sizes 0-36W and three height options – Short (if you are 5’3” and below); Tall (5’9” and above); and Regular (5’4” to 5’8”). 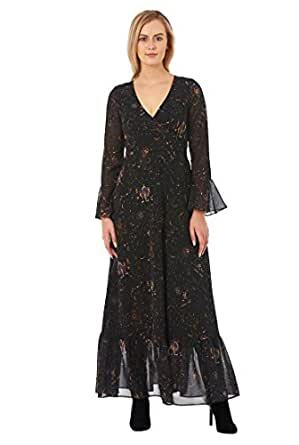 Our zodiac print georgette maxi dress is styled with a surplice bodice, ruffle cuffs and a full flare wrap skirt with ruffle flounces at the hem.